You'll be £19.99 closer to your next £10.00 credit when you purchase Berlin Airlift. What's this? In June 1948, Joseph Stalin halted all road and rail traffic in to and out of the Allied sector of Berlin and cut off all electricity to the city. The only route into Berlin was by means of three twenty-mile-wide air corridors across the Soviet zone of Germany. Thus the wartime allies of Britain, France and the USA realized that the only option open to them was to supply the beleaguered West Berlin by air transport and so started one of the most dramatic events of the twentieth century. The airlift started in June, 1948. At the beginning there were three loading airfields: Rhein Main and Wiesbaden in the American zone, and Weinstorf in the British zone. By September of 1948 the airlift was transporting a massive tonnage of supplies into Berlin, including coal, food, medical supplies and all the other necessities of life. A mixed fleet of aircraft plodded their endless path to and from the city. Both Ex-planes and pilots were dragged out of retirement. In September 1948 the Russian military threatened to force down western aircraft if they flew outside the 20-mile wide corridors but by March 1949 a total of 45,683 tons of supplies per week were being flown into Berlin. In April Russia finally announced her intention to end the blockade. 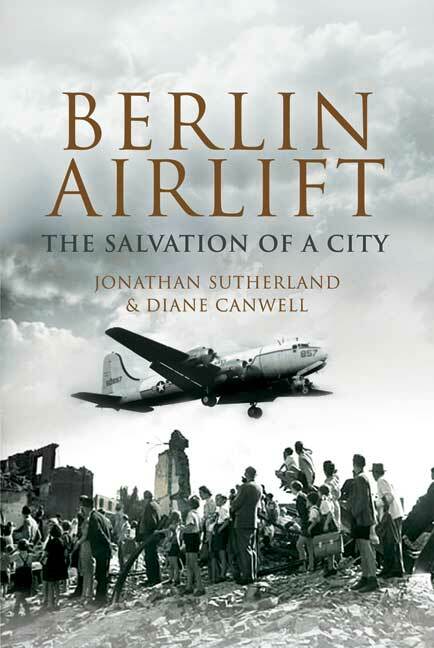 As my Father took part in ground operations supporting the Berlin Airlift and was actually stationed in Berlin at the time, I was fascinated by the content of this excellent volume which tells the gripping story of how the Russians, following an order from Stalin cut off all road and rail traffic into and out of the Allied Sector of Berlin in the early Summer of 1948. Suddenly, Berlin became a city under siege! Now, the only way to get much needed food and medical supplies and other necessities of life into the beleaguered city was by a narrow air corridor that stretched just twenty miles wide and which crossed over the Soviet occupied zone. Not to be defeated, Britain with its wartime allies â€“ France and the USA answered the call for help, however this demanded skill, courage and sheer determination. Wartime aircraft and pilots were therefore dragged out of retirement and in spite of threats the Russians to destroy any aircraft straying off course, the city was saved and by the time the blockade ended 328 days later, over two and a quarter million tons of essential supplied had been ferried into what eventually became known as West Berlin. The authors- specialists in military history and warfare have carried out extensive original research and as well as providing the reader with an excellent insight into Operation Plainfare, they have also included many superb atmospheric photographs of the aircraft, equipment, personnel and of the German population too. There is a very useful bibliography and an appendices which includes details of the RAF units involved, monthly tonnages, examples of Soviet harassment, a chronology of events and copies of original documents relation to rationing. A very useful and fascinating volume that will appeal to many veterans who served in Berlin at the time together with students of social history and logistics and of course both military and aviation enthusiasts too.